My first show in awhile and my first show since moving back to SF. I couldn’t have chosen a better band for my first show here. 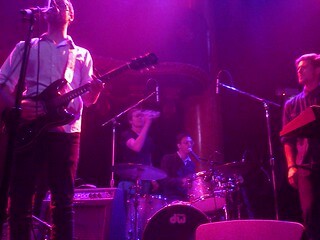 The GAMH is a super awesome space. The ceiling is quite ornate in the shape of a woman’s body (thank you, foursquare). Its quite the intimate spot with tables wrapped around the venue making it a great place for dinner and a show. Sweet Lee Morrow, keyboardist with the Spree, opened the show with a folk acoustic set. He sat down in the middle of the stage with just a lone chair and guitar. He sang a few songs, made some quips about songs not for the young ones (ah the ever great all ages shows) and finished the set in a fast 20 minutes or less. Next up, New Fumes. 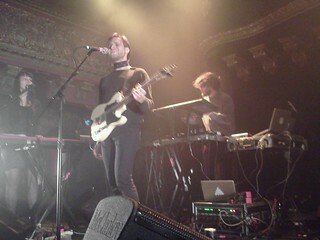 I was surprised that the audience didnt seem so into it, and for just one guy he had some great beats. An electronica set with interesting beats and Star Wars as a backdrop, not bad. Oh yeah, and danceable music. I was quite loving it. A few minutes before 10pm and a red sheet/screen is covering the stage. 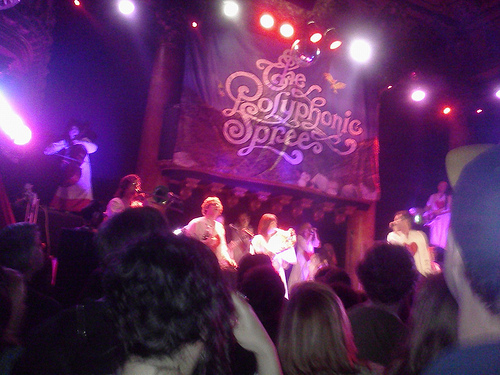 Its a wonder how many members are in The Polyphonic Spree these days and how will they fit them all on the stage. Right away you could tell 2 players would be high up above the others. Soon, a heart is cut out and out pops Tim DeLaughter’s head. The rest of the sheet is then cut and pulled off and GAMH has turned into a stage filled with at least 13 members (although I swore there were more). Way high up above would be the cellist and guitarist. In the center are 2 rows of choir members that are beyond giddy. Of course, my favorites, the horns comprising a french horn, trombone and trumpet. Its a whirlwind pace of a show with white robes swooshing and a big red heart stitched into the middle. Who wouldn’t want to be a member of that cult band. Musical director/lead singer Tim DeLaughter takes us on a tour of the Spree’s musical catalog. Directing the instruments and choir it begins to feel like a gospel baptist church. 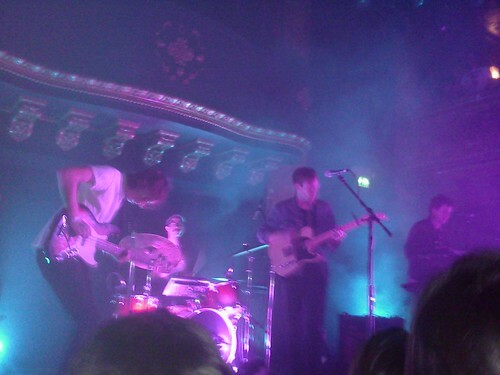 Its hard to not get caught up in the euphoria that the band brings. Everyone swaying and dancing with hands extended into the air. Plenty of peace signs flashed throughout the show along with heart-shaped hands. Some of the highlights included ‘2000 Places’ which early on got the crowd moving and dancing. The new single ‘Bulls Eye’ sounds quite great. The Who medley was pure brilliance as Tim leads the band through a nearly 10 minute performance that includes a rockin’ ‘Pinball Wizard’. The french horn and cello got lots of play during that. ‘What Would You Do’ had the choir doing some great harmonies and vocals. So soon they’d be off the stage. 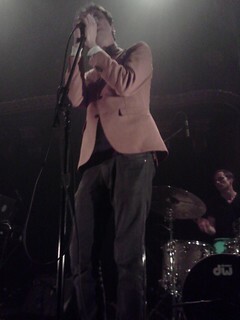 Tim said how awesome it was to be in SF again and how they’d be back again real soon. As in one month, maybe one night, and then he said theyd play again today at 7:30am and asked if we’d be there. Obviously, if there was a 7:30am show we’d all be there regardless. The band then left the stage for a few minutes before coming on and doing a march through the crowd. The band members kept on coming – high-fiving the crowd and waving hello. The encore consisted of ‘Together we’re Heavy’, crowd favorite ‘Light & Day’, ‘We Sound Amazed’ and ‘The Championship’. It is one hell of a one-two punch when oen of the last songs you’re singing is ‘Follow the day and reach for the SUN!’ – which should be an anthem for the band (and prob for most of us in general). The band finally left the stage (after a nearly 2 hour set) for good with each member walking off the stage and waving goodnight. As the band members left soon it was the cellist, who seemed to be having a hard time getting down from the riser and 2 singers and Tim. As each person left it got a little quieter, but the audience got louder. Soon it was just us and Tim singing ‘All in good time, we’ll come round, raise our voice, make another sound’. And then it was just us and the audience continued singing that line and simply put… it was beautiful.